I’m thinking a lot about the typical things one might think about when their birthday rolls around. Well, if one is me, these are the typical things one might think about. I think about how I’ve grown as a person in the previous year of my life. About new experiences I’ve had. New friends I’ve made and new relationships started. I also think about the coming year, and what I want to accomplish and become. Go on a belated honeymoon with Matthew. Institute and maintain a date night every single week with my man. Exercise at least five days a week, every week. Try a food I’ve never tried before. Record a memory for every day of the year. Take more photographs with a real camera. Start an IV on an actual patient. Make out with my husband under a waterfall. Go on an overnight hike with Matt. Read at least one book a month during my school year. Buy a real Christmas tree. Visit a city I’ve never been to before. Plant a vegetable garden next summer. Blog five days a week. Spend more time with mine and Matt’s families. Yesterday was my birthday. I turned thirty. Thirty! It seems so ridiculous. I had simultaneously dreaded turning thirty and looked forward to my thirtieth birthday at the same time for the last year or so. Amy and I talked about her throwing me a birthday party. We would have friends come over and have a good time. Then we broke up, and that kind of died. I was only dreading my birthday. No fun celebration. Just reaching a dreaded milestone. So I planned to take my kids and go on a camping trip with my parents and brothers. Then the rain came. For days it has done nothing but rain. The one thing I always do on my birthday is go watch Fireworks at the lake in Kingston, since my birthday happens to be on the Fourth of July. This year, though, for the first time that I can remember, they cancelled the Fireworks. I cannot even possibly tell you how sad I was yesterday morning. Nothing happened the way I imagined it. Amy and I weren’t a couple anymore. There was no party. My kids were at their dad’s. It was gray and gloomy and raining. No fireworks. No friends. No presents. No cards. I admit, I laid in bed and cried. But. (So glad there’s a “but” to this story.) But then Chris brought my kids home. He was still at the house, sitting in the living room chatting with me and Amy, when someone knocked on my door. It was my mom. She stopped on her way home from camping at the lake to tell us that they had packed everything up early and headed home because of the rain. She said they were all grilling burgers and hot dogs at my brother’s house that evening. Suddenly, it went from a horrible day with nothing to do because of the rain to a metaphorical parting of the clouds. Me, Amy, and my kids went up to my brother’s house. We hung out with my family. We ate burgers. We played cards. Two of my brothers beat the crap out of me. (Birthday spankings are no joke when you are frickin’ thirty!) Strangely enough, we spent over an hour singing. We were playing cards, and I randomly started singing “Just A Little Talk With Jesus” while I was dealing. My mom joined in with me, and then my brothers and sister-in-law and Amy. We sang song after song. Lucas went and got his guitar. We mostly sang church songs, but I must admit we sang “Friends In Low Places”, “Ice, Ice Baby” and “Baby Got Back”, too. Shh. Don’t tell. It wasn’t something that we have done before, but it was actually really fun. 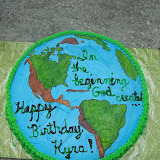 After we sang, we had a delicious ice cream cake that my sister-in-law, Misty, made for me. I went home with a smile on my face and some really good memories. It wasn’t what I had been looking forward to for a year, but, even without cards or presents or lots of friends, my birthday was redeemed, despite the torrential rains. I had my family, my kids, and my very best friend with me, and, dang it, we had a good time. Today is my handsome husband’s 33rd birthday. In order to get in shape for Army this summer, Chris is on a diet. So he got to celebrate, not with our customary lasagna and cake (cheesecake if he’s lucky), but with plain chicken breast and steamed veggies. He got a yogurt for dessert. His birthday activities included working out and going to work. Whole lotta yay, right? Poor guy. One thing he does have going for him today is the fact that he has four beautiful children who adore him. They picked him flowers (white clover), and then they made him this video. Happy birthday, Christopher. I love you! Today is my first baby’s sixth birthday. It’s hard to believe it’s possible that she could be that old. Time has really flown since this day six years ago. I still remember it all like it was yesterday. God sent us a special blessing when he gave us our Kyra Joy. Happy birthday, Kyra Joy! I love you more than words could ever express. I got my beautiful baby girl six years ago, and you were everything I ever dreamed of or hoped for. I love you, Baby! I failed to blog about them on their birthdays, but Kyra turned five on the 20th and Owen’s first birthday was the 26th. Today, we had a party for both of them. Here are most of the kids. I think it’s everyone but Owen. Kyra got lots of really great presents. Kyra was really excited about all of her great new toys! Owen needed a little help with his stuff. …but I think there was a clear winner!!! When we gave Owen some cake, he was a little timid at first. He got the hang of it, though. Mamaw gave Owen a bath after all the cake. Kyra helped bake Daddy’s birthday cake. Then, she really licked the bowl! Daddy was more enthusiastic about his cake before I got the camera out.